If you're ever in the Australian outpost of Port Hedland, make sure you've got a high limit on your credit card. The dusty downtown of this isolated hamlet of 20,000 may be a few deserted streets lined with bank branches, the local cultural scene confined to drinking halls and pool tables. But when the bills come, you'd think you were in Beverly Hills. A brunch of two scrambled eggs, toast, hash browns and a Coca-Cola at a greasy diner comes to more than $20. A local hotel with rooms that are little more than sunbaked concrete cubes charges $300 a night. Taxi fares are outrageous enough to embarrass a Tokyo or London cabbie. The front window of a real estate agent's office is plastered with flyers advertising one-story, three-bedroom homes  the kind found just about anywhere in Australia  on sale for more than $1 million. Why would anyone pay such crazy prices to stay here? "China needs its iron ore," says Tony Swiericzuk, a local resident and a general manager at Australian mining outfit Fortescue Metals. That explains everything. Favorably located on the northwestern coast of Australia, Port Hedland is the point through which the iron ore, copper and other resources dug up from the wastelands of the interior get shipped abroad  more and more to the voracious Chinese economy. 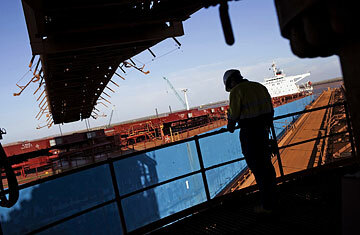 Last year 70% of the exports from Port Hedland were bound for China, up from 45% in 2005. That surge has turned Port Hedland into an indispensable part of Australia's economy and a hot destination for mining executives. The port can barely keep pace with Chinese demand. Its capacity has tripled over the past eight years, and Lindsay Copeman, acting chief executive of the Port Hedland Port Authority, expects it to double again by 2016. "It's a very fast-evolving process," Copeman says. "Instead of being a gentle growth curve, it's an exponential curve, and we're almost at a vertical wall." All of Australia has been enjoying that climb. The Chinese-driven boom at Port Hedland is symbolic of the growing giant's impact on the entire Australian economy. Chinese demand for Australian exports, especially raw materials, was one big reason Australia didn't fall into recession after the 2008 financial crisis. Since China will get even hungrier for natural resources as its economy roars ahead, Australia is likely to become more and more dependent on the Middle Kingdom. Ben Hunt, an economist at the International Monetary Fund, estimates that roughly 12% of Australia's GDP growth during the past 10 years can be attributed to trade with China; over the next decade, that share could reach 35%. Colin Barnett, premier of Western Australia, Port Hedland's home state, says China has been "probably the single biggest factor" behind the region's strong performance during the Great Recession. "China's almost insatiable demand for natural resources continues to drive our economy," he says. That's good news in many ways. China is becoming the largest customer for just about everything, from cars to meat, and the countries able to tap into that surging Chinese wealth will be rewarded with more jobs and faster growth. As China's economy grows ever bigger, more and more companies, industries and economies will be sucked into its orbit, just like Australia. China's resilience helped lift Japan, South Korea and other Asian neighbors out of the recent downturn and boosted commodity exporters like Brazil, while Chinese money is building roads and creating jobs across Africa. What's going on Down Under is a glimpse into the future for everybody. That future also leaves many nations a bit queasy, however. Heavy Chinese influence has become a source of public ire and political debate in Zambia and elsewhere in Africa, while Brazilian officials grumble that Beijing's trade practices stifle local industry. Australians, too, are becoming concerned about the potential downside of their growing reliance on the rising giant. "Australia's economy is becoming frightfully dependent on the function of Chinese policymaking," says Scott Ludlam, a senator from Western Australia from the opposition Greens party. "We're setting ourselves up for vulnerability." In a survey conducted this year by the Lowy Institute for International Policy, a Sydney-based think tank, 57% of respondents said the Australian government allows too much investment from China in the country, and 65% thought China's aim was to dominate Asia. "There is almost a subconscious concern [about China] that is creeping into the Australian psyche," says Michael Wesley, Lowy's executive director. The more important China becomes to Australia's economy, the more wary Australians become about China. They've woken to how China's political values sharply contrast with their own  highlighted by the opaque Chinese court proceedings that led to the 2010 convictions of four employees of British-Australian mining giant Rio Tinto for accepting bribes and obtaining commercial secrets  and Australia's government has jousted with Beijing over human rights. Australian leaders, concerned about China's expanding military power, have also strengthened their nation's strategic alliance with the U.S. even as economic ties to China intensify. Prime Minister Julia Gillard has attempted a delicate balancing act, charming Washington with pledges of friendship in March while inking agreements to boost trade and tourism during a trip to Beijing in April. The contradictory sentiments can even be found within Australia's mining industry, the sector that has benefited the most from China. China gobbled up 37% of Australia's mineral exports in the past fiscal year, up from a mere 5% a decade earlier. That demand is encouraging a surge of investment in the sector. Mining companies invested more than $40 billion in Australia in 2010  nearly triple 2005's amount. Another $140 billion worth of mining and energy projects are under way, estimates the Australian Bureau of Agricultural and Resource Economics and Sciences, almost seven times as much as six years ago. "Australia is about to embark on its biggest mining-investment boom since the 1850s Gold Rush," Australian Treasurer Wayne Swan recently boasted. See "Aussie Mining Exec Arrested for Spying in China."